Trendy shirts sweat pants and hoodies adorned by emaciated models with coy smiles across their faces. Each one given their own ‘team’ logo to sport on the back. What do the models have displayed on the backs of their jerseys? Not football. Although treated as such, drug abuse among young adults is far from a ‘fad or trend.’ It’s a startling and heartbreaking epidemic, and unfortunately, fashion is showcasing a sad reality that already exists for many college students. According to the National Survey on Drug Use and Health, 1-4 people aged 18-20 report using prescription drugs non-medically at least one in their lives. Misusing or abusing prescription drugs are not ways to cope with the stresses of college or making a night out much more fun. 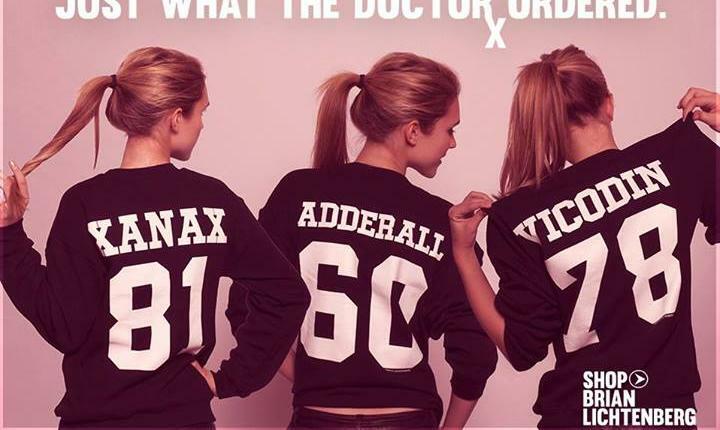 Recreationally taking pain relievers, sedatives or antidepressants is dangerous, not a joke, like these tees teased by Kitson makes it out to be. They might often take a medication at a different or higher dose or self-medicate with someone else’s medicine. This is a rampant and oftentimes blurred line of drug use across college campuses. Popping a roomies Percocet to ease headache pain or asking for a dose of Adderall to pull an all-nighter are examples of misusing a drug for its original intentions. Intentionally using a prescription drug to experiment with it, feel good or get “high” is an example of prescription drug ‘abuse’. Someone who abuses prescription medications is also likely to combine them with alcohol and/or crush pills and then snort or inject them to get a quicker, more intense high. Whatever the reason, using these medications without a prescription or medical oversight of their risks can lead to addiction, overdose and even death. Prescription Perfect Storm. Perhaps the most concerning aspect of drug use and possible abuse is the potential danger off-campus activities present to students. While the occasional mix of work and play usually has no harm; there are devastating and long lasting impacts to those who use without understanding the repercussions of their own, or their friends, prescriptions. Roughly half of all college students binge drink and a growing number report misusing or abusing drugs. Taking these two substances together or with other illicit drugs can quickly turn into a dangerous and deadly cocktail. Students who do not regularly use medications and drink copious amounts of alcohol can seriously threaten their ability to accurately judge self-control. The true danger is that many substances have a deadly interaction with one another; drugs and alcohol don’t mix. Keep Medications Safe. If you are sharing a living arrangement with someone who uses medications or you yourself require them, invest in a lock box that only the prescribed individual knows its location. Be Bold. Take the step either as a caring roommate, a loved one or for yourself and take action to become advocate and raise awareness about the dangers of drug misuse and abuse. Seek out help from your campus counseling centers and keep your family involved along the process as well. While college will always have its ups and downs, you no longer have to suffer along the way.